Chiefs wrap up a five game home stand with three games within U.S. division this week. The start to the Chiefs 5 game home stand had been pretty average in the results department for Spokane. The start to the Chiefs 5 game home stand had been pretty average in the results department for Spokane. 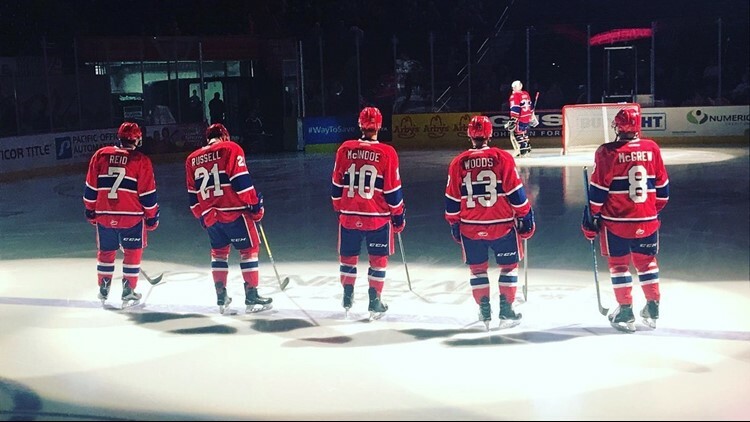 The team split the first two games of the 5 contests to be played at the Spokane Arena, and while .500 hockey may be OK for a team looking to rebuild, it's not so great for a club looking to contend for a title. More importantly, the Chiefs had not played particularly well in either game; pulling out their one win behind a great effort from goaltender Bailey Brkin. The games played last week and this are the team's first tests against the clubs in the U.S. Division, and are an early barometer to see how Spokane measures up against their chief competition in the West. First up were the Seattle Thunderbirds, who came into Tuesday's contest just one point behind the Chiefs for third place. The entire division was separated by just 5 points between first place Everett and fifth place Portland, so every game is huge as far as making progress towards the top or bottom of the division standings. The Chiefs lost 5 of 8 to the T-Birds last year, and were hoping to get off to a better start in this year's season series. The team also got some good news with the return of defenseman Filip Kral, who played his first game of the season after rehabbing from off season surgery. Tuesday's game started well for Spokane as Jake McGrew's back hand slid through the pads of Seattle goalie Liam Hughes with just 1:02 left in the first period to give the Chiefs a 1-0 lead. Spokane extended the margin to 2-0 as Riley Woods scored a power play goal just under 8 minutes into the second period. Seattle cut the margin to 2-1 with a goal late in the second, as the Chiefs took a one goal lead to the third for the second straight game. The last time had not turned out so well, as the Chiefs coughed up 4 goals in the third in a 5-3 loss to Tri City. This time around, Spokane had learned their lesson, as they turned in their finest period of the home stand thus far in the third. Woods scored his second power play goal, and team leading 10th of the season 6:20 into the third to make it 3-1 Spokane. Goalie Bailey Brkin and the defense did the rest, shutting out the Thunderbirds on just 5 shots in the period. The Chiefs Egor Arbuzov capped the scoring with his first WHL goal with an empty net tally with just over a minute left to wrap up an impressive 4-1 victory to start the week. It was a good win, as the Chiefs were without Jaret Anderson-Dolan, who was a late scratch. The club is also without rookie center Jack Finley, who is off playing for Team Canada in the Under 17 Tournament the next week and a half. Next up were the division leading Everett Silvertips on Saturday, who had lost the night before at home to Tri City. The Tips had out shot Tri City 55-16, yet had still lost as the Americans pulled even with Everett for the top spot in the division, one point ahead of the Chiefs. A win would pull Spokane into first place all alone at the top of the U.S. The first half of the first period saw the Chiefs carry the play but neither team was able to get a lot of quality offensive chances. The Chiefs then took three straight penalties in the first, and were on their heels the rest of the period. Everett converted 2 of the three power plays and scored 3 goals in 3.5 minutes to grab a commanding 3-0 lead after one. Spokane didn't respond very well as they came out in a word...dreadful...in the second. Everett scored 2 more goals and pretty much put the game away with a 5-0 lead after 2 periods. The Chiefs got on the board on a power play goal from Cordel Larson, his first WHL goal just over a minute into the third period, but the Silvertips third power play goal of the night just over 5 minutes later put the game away at 6-1. Spokane would cap the scoring as Carter Chorney scored the Chiefs second short handed goal of the year with just under a minute and a half left, but the damage had been done far before as the Chiefs dropped a 6-2 decision. The loss left Spokane 3 points back in the U.S. and with Portland's win over Victoria, the Winterhawks and Chiefs were now tied for third with 19 points as Portland came back to the Spokane Arena for the second time in two weeks to cap the Chiefs 5 game home stand. Spokane had won the first meeting with Portland with a resounding 4-1 win in the first game of the home stand, but the Hawks came in on a roll, having won 2 straight at home over the #7 team in the CHL in Victoria the previous two nights. The Chiefs wanted to get off to a quick start against a team playing their third game in as many nights, and they did just that, as Riley Woods scored just 3:18 into the game to give Spokane a 1-0 lead. Portland countered with two goals 4 minutes apart to take a 2-1 advantage, but the Chiefs came right back as Adam Beckman's power play goal and Ethan McIndoe's 4th of the year 1:37 apart late in the period gave Spokane the lead once again at 3-2. Portland would close the period with a penalty shot goal in the final 2 minutes though to send the game to the second tied at 3-3. The Chiefs were out shot 23-10 in the period as goalie Bailey Brkin kept Spokane in the game. In the second period, the Chiefs would take their biggest lead of the contest as Luke Toporowski and Woods scored 29 seconds apart midway through the stanza to give Spokane a 5-3 lead. Portland would get their second power play goal of the night late in the period to cut the lead to 5-4 after two. The Winterhawks would tie the game at 5 just over 4 minutes into the third, but the Chiefs came right back to take their 4th lead of the night on a Nolan Reid goal 1:35 later to make it 6-5 Spokane. Back came Portland as their 3rd power play goal midway through the period re-tied the game at 6. The Winterhawks then scored their 4th power play marker of the game with 3 minutes left to cap a 4 for 7 night with the man advantage to take the lead for good at 7-6. An empty net goal in the final seconds wrapped up a 4 goal third for Portland and a come from behind 8-6 victory. The Chiefs were out shot 53-23 on the night as Brkin got little support defensively from his teammates on the ice. The games against Everett and Portland saw Spokane surrender 7 power play goals in 14 attempts as the team took unnecessary penalties and played lax defense at critical periods of both games. A lot of the defensive lapses came as the club did a lot of puck watching instead of guarding the man. Fundamental mistakes lead to defeats, and the Chiefs found that out quickly. Spokane went just 2-3 in their 5 game home stand, and now find themselves in 4th in a tight U.S. Division. The Chiefs are just 3 points out of first, but if they continue their current habits, that deficit will double in no time. To say Spokane has been a roller coaster is a classic understatement. The team hasn't won more than 2 in a row through 17 games, and have not lost more than 2 straight. Their only consistency has been their inconsistency. While it's still early in the season, Spokane needs to start finding their identity as a team and quickly. The division is extremely tight and competitive this year, and falling 10 points back will be too much to overcome...even midway through the season. Spokane will try to turn it around with a three game road trip which begins Victoria on Friday and Saturday. The Royals have been in the Top 10 in the CHL for the past couple of weeks, but after losing two in Portland, may drop out of the rankings by the weekend meetings. Victoria has proven to be a tough match-up for Spokane the past several seasons, and one thing is for sure; if the Chiefs play defense like they did against Everett and Portland, they'll come away with two more losses. It's time to put on the work boots and see the team get back to the level they're capable of playing. I'll have the call for both games on 1510 KGA starting with the pre-game shows at 6:30 pm, and the puck drops at 7:05 pm. Let's hope the boys bounce back and we'll see you the radio!